4 hours long. Price is $365 per person in a party of two. For larger parties, please see complete price table below. Explore this historical city with your private guide. 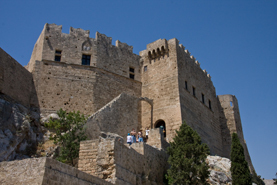 Visit the acropolis of Rhodes and the Medieval city, including the Grand Master's Palace and the Street of Knights. Founded 2,400 years ago, Rhodes Town, the fascinating capital of Rhodes, is located on the north-eastern tip of the island. A melting pot of the remnants of its ancient and medieval past, together with the hustle and bustle of present day cosmopolitan life, awaits your visit. Our tour begins with exploration of the ancient Acropolis of Rhodes on the summit of Monte Smith Hill, including remains of the Temple of Apollo and the restored ancient stadium and odeon. Only a few minutes from the acropolis, we enter a very different atmosphere, with high walls, deep moats and narrow cobbled streets leading to the medieval town of the knights. Byzantine churches, inns, hospitals and mosques co-exist in the most traditional Greek setting, touched little by the hectic pace of modern life. One of the most impressive buildings within the walls is the Grand Masters' Palace, which houses a superb collection of original mosaics from Kos island, dating from the Hellenistic period to early the Byzantine period. Stroll the charming Street of the Knights, with inns and consulates built in the distinctive styles of the various countries of the resident knights. * For touring on Sundays and holidays, a $250 supplement applies per travel party (not per person).